Fiori beauty products contain essential oils and/or fragrance oils that have been carefully selected to work in unison with your skin’s natural chemistry. We also specialize in providing you the best quality Goat Milk Soaps. Each small batch is carefully crafted from the finest natural ingredients, and stamped with the Fiori seal of approval. Fiori soaps are made with glycerin and natural, sustainable Coconut Oil, Palm Oil, and milk made by happy goats that are never fed anything genetically modified or containing animal bi-products. These pampered goats are raised on farms that do not use sprays, insecticides, or pesticides. Our Goat Milk is whole and pasteurized and has no BGH( growth hormones), antibiotics, or preservatives. Handcrafted, handmade soap is great for the skin and adding milk only makes it better. Goat milk is particularly moisturizing and nourishing to the skin because of capric-caprylic triglyceride. Capric-caprylic triglyceride is an effective skin moisturizer that helps to contribute to skin softness by forming a barrier on the skin to help inhibit the loss of moisture. It is the only milk that contains naturally occurring capric-caprylic triglycerides. The protein strands of goat milk are shorter than other types of milk and are more readily absorbed by skin. Goat milk is also fantastic in handmade soap because it has a lower pH (between 4.0 and 6.4), thus reducing the overall pH of the final bar of soap. Goat milk also has naturally occurring lactic acid that helps keep skin smooth by encouraging skin turnover (it acts similar to a gentle peel). It also contains many vitamins, specifically A, D, B6, B12, C, E as well as the antioxidant Selenium. The result is a gentle cleanser that maintains your skins natural oil balance, leaving your skin moisturized and beautiful to the touch. 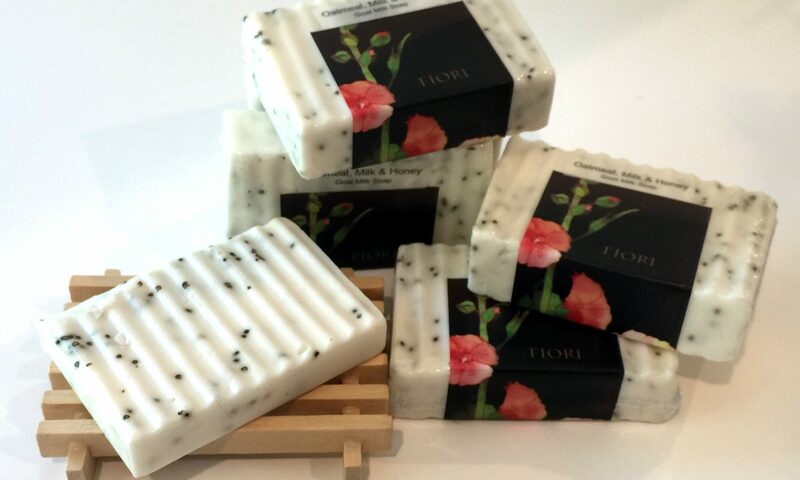 Fiori Soaps is also gentle, caring place where each product is handcrafted with love and pride. Our organic ingredients come from local sources and are cruelty-free and not tested on animals.